The Argument that NCAA clock management can't accurately dictate when the clock will start after a missed foul shot is tipped is not a solid argument. 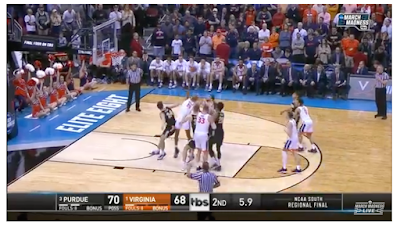 In the Purdue vs Virginia 2019 Elite Eight game, EVERYBODY in the Arena knew the second foul shot had to be missed for Virginia to not end up losing by one point. Ball is tipped with 5.9 seconds left from about 12 feet from the rim. Even the Television Announcers said in advance that the second foul shot needed to be missed. On top of that, as soon as the ball bounces off the rim, the Clock Management dictates to be ready to start the clock as soon as the ball is touched. Clock Management took approximately 8 to 10 video frames before the clock started counting down from 5.9 to 5.8 seconds. Tipped Ball Travels about 10 to 12 feet after tap without the clock moving. Ball is in the air on level with the rim, near the 3 point line. clock is still stuck at 5.9 seconds. During the time the Clock did not move, the ball was tipped and then floated through the air for 10 to 15 feet before the Time Clock moved from 5.9 to 5.8 seconds. Sports Cam Detective calculates that between 0.25 to 0.30 seconds elapsed before the Clock started. 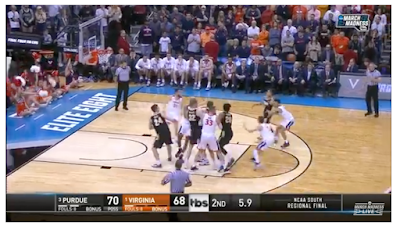 Virginia Game Tying Shot in Regulation against Purdue appears to be on one fingertip or just leaving fingertip with 0.4 seconds left. However, the clock won't change unti it is .30, so we don't know if there was .4 or .31 seconds left. If only .31 seconds was left when the shot left the fingertips, the late clock start at the beginning of the play definitely caused the shot to be taken after time had expired. Aren't you curious to know the real truth? It appears the Shot that tied the game was taken with around 0.4 seconds, but it might have been anywhere from 0.42 to 0.35. However, this would have fallen with the 0.1 tenth of a second increment. If the Clock had started at the moment the ball was tapped, it is possible that the finals shot might have still been on the Shooter's fingertips as the clock turned 0.0. Whether or not the Shot would have still been within time, it sure would have made for one of the most gut wrenching game regulation endings to see the ball either barely leave the shooter's hands, or barely still be at the fingertips as the time expired. In Sports Cam Detective's opinion, Clock Management may have altered the destiny of Purdue and their Fans, yet it will never even be investigated and possibly have some type of method implemented so future games don't rely on the whim of when the shot clock starts so late in a game with so much on the line. One other aspect of the final play that will probably be forgotten is the absolutely perfect shoulder level pass. If the final pass had been anywhere else but where it was throw, precious time would have been lost as the shooter would have had to rebalance before taking the final shot, and that can take an extra 1/3 to 1/2 second. Justin Turner misses chance to end Red Sox ninth inning of 2018 Game 4 World Series between Dodgers and Boston, Sox score four more runs. It is not Justin Turner's fault, and not much discussion was given to what third baseman Justin Turner did in the ninth inning versus what he should have done. With runners on first and second base and two outs, a slow grounder was hit to Justin Turner at third base. Turner had to charge in and make a valiant throw to first base, but the speedy left handed hitting Andrew Benintendi beat the throw to first base. However, if infield coaches throughout the baseball world would preach that with runners at first and second base that third base should be viewed as the new first base things might have gone much much better. The top of the ninth inning would have ended with an out at third base, the Red Sox up by only one, and who knows, maybe the Dodgers still get their two run home run in the bottom of the ninth inning to win it? 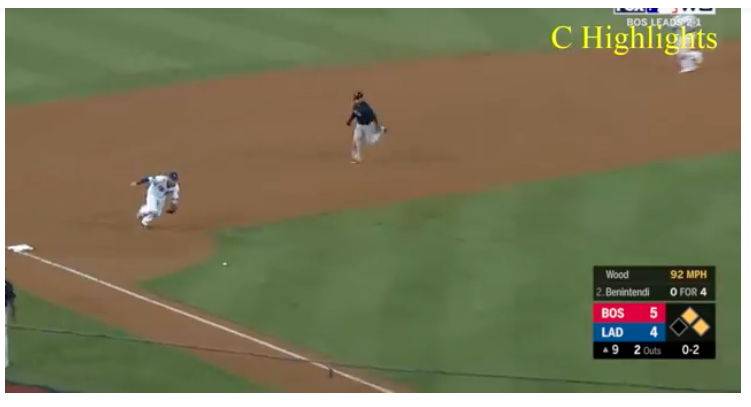 If Justin Turner does not charge the ball and instead stays within the actual base path on this soft grounder, the out would have been at third base and the top of the ninth inning would have been over with the score only 5-4. Instead, Turner charged the ball and threw to first base and the runner was safe at first base, and four more runs scored later in the inning. The Dodgers would score two runs in the bottom of ninth inning to make the final score 9-6. But if Turner had gotten the final out at third base and the Dodgers had still scored their two runs, the final would have been Dodgers winning 6-5 in game four of the 2018 World Series. 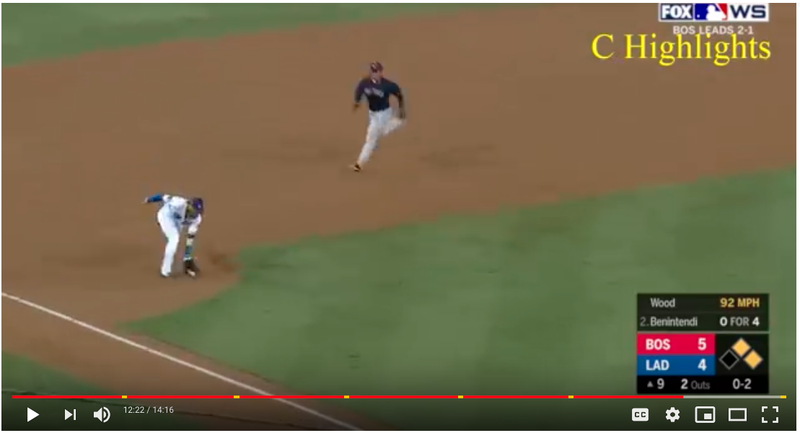 So why isn't it Justin Turner's fault that he raced in to get to the ball quicker to have a better chance at first base when the wiser play would have been to plant himself on the base path and wait for the ball to come to him? It's up to the infield coaches to drill in the concept that when there are runners on first and second, that third base becomes the new first base in certain instances. It is also imperative that the third baseman learns to OWN the invisible base path between second base and third base if he can legitimately field the ball while in the base path. This poses many problems for the baserunner. If the baserunner collides with the third baseman, the runner is automatically out. 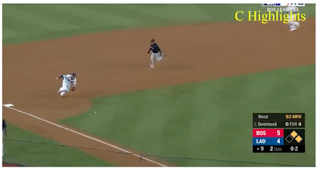 If the baserunner runs in front of the infielder and blocks the third baseman's field of view, the baserunner is out. If the baserunner is hit by the ball, the baserunner is out. If the baserunner runs around the third baseman by going behind him, the baserunner may add another half second to one second time to his dash to third base, which basically mitigates the advantage of having a bigger lead off of second base then one can usually get off of first base, and then some. Would the Dodgers have gotten two runs in the bottom of the ninth inning if the Red Sox had only been leading by one run? Of course we will never know, but being down by one run going into the bottom of the ninth inning is certainly a better scenario than being down by five runs. Four more runs scored after the potential third out was not recorded on this particular play. 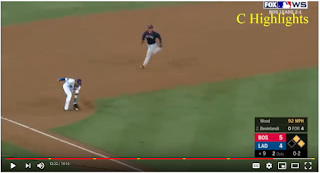 There was a brief discussion by the announcers as to whether or not Turner, after charging the ball, could have gotten back to third base before the baserunner reached third base. However, the issue of Turner staying back on the ball was not discussed. I have seen the staying back strategy worked to perfection by the New York Yankees in a game against the Cleveland Indians. 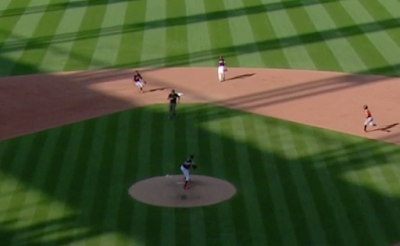 Francisco Lindor was the runner at second base and he ended up being called for running into the infielder. In that instance the shortstop, it might have been Jeter in his final year, deliberately stayed in the basepath when the more logical move would have been to charge the ball. But as long as Jeter had a path to the ball, he is allowed to occupy the base path and it basically meant Lindor would have been out no matter what he did. Umpire Interference causes Trevor Bauer and Francisco Lindor to miss double play opportunity in 7th inning of 2018 Game 3 Houston vs Cleveland Playoff Game. SportsCam Detective feels so alone sometimes. Apparently nobody else in the world noticed that the second base umpire ran in front of the play at second base and obstructed both Trevor Bauer's and Francisco Lindor's view of EVERYTHING during the most important play of the 3rd game of the 2018 playoffs between the Houston Astros and Cleveland Indians. 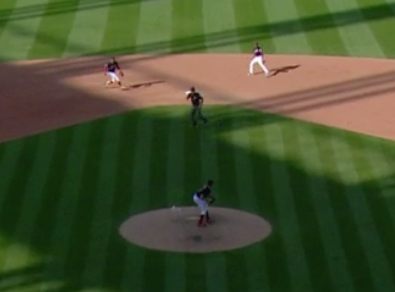 If the Umpire had not run through the middle of the infield during the play to get a better vantage point this would have been an inning ending double play in the top of the seventh inning, game three of the 2018 Houston vs Cleveland playoff series, the score remaining tied 2 to 2. Trevor Bauer would have come out for the eighth inning have pitched very effectively. Home field advantage would have been Cleveland's. Instead, Bauer was replaced the Houston just pummeled what was known to be a questionable back end of the bullpen, something that Francona knew and was trying to avoid. This one Umpire Interference play that was never even noticed by Dennis Eckersley, but it entirely changed the narrative of the series between Houston and Cleveland. Instead of possibly being down 2 games to 1 with Carlos Carrasco set to pitch game four, and Cleveland having had the lead for most of games 2 and 3, this missed Umpire's Interference call changed the Narrative to Houston was the superior team as they racked up 10 more runs from the 7th inning through the ninth inning. This one play completely changed the dynamic of the playoff series, and it was never even mentioned by Eckersley. Trevor Bauer is already set to throw the ball to second for an inning ending double play, but to who? He can't lead either infielder because the Umpire is blocking his view and the path of where Bauer should be throwing the ball. Yep, in the middle of the most important play of the game for Cleveland, the Umpire has decided to get a better vantage point of the play even as his own wrongful actions change the destiny of the play. 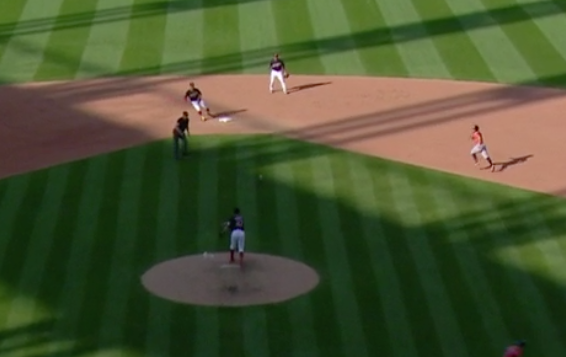 The Umpire has literally now COMPLETELY blocked second base from Bauer's view. Bauer had started his arm motion to throw to second. 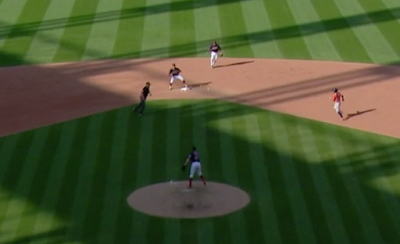 If Bauer stops, the play is dead all around, so he continues his arm motion to second base hoping to correctly anticipate where Lindor will be. First the second base Umpire blocked the view of second base from Bauer, now he is blocking the flight path of the ball in terms of where the throw would need to go so that Lindor can take the throw and in one motion tag second base and then throw to first base for an inning ending double play and game saving play. The Umpire is still trying to scramble to his new vantage point even though the damage has already been done. It just gets worse and worser and worstest and every other wrongful grammatical word one can think of. 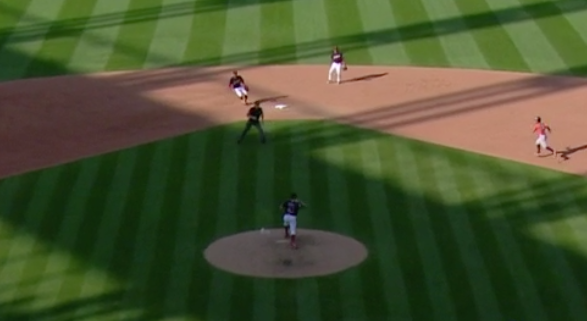 First the Umpire blocked Bauer's view of second base, then he blocked the path of the ball to where Bauer needed to throw the ball so he could lead Lindor to the bag, now the Umpire is actually blocking the line of sight for BOTH Bauer and Lindor so neither player see each other. Whew, the Umpire is FINALLY out of the line of sight of Bauer and Lindor, um, except Bauer has already thrown the ball and the ball is already halfway to the wrong side of second base. Bauer threw the ball before he could see Lindor because he had no choice and he clearly threw it to the right of the Umpire. Unfortunately in this situation the pitcher should be throwing to gracefully lead the infielder, not throwing so far to the right of second base because he literally threw the ball where they ain't. Both Bauer and Lindor clearly acted in a tentative manner specifically because of the Umpire's bad decision to cross in front of the play, Bauer throwing too far to his right and Lindor moving too slowly to get to the ball quickly enough. 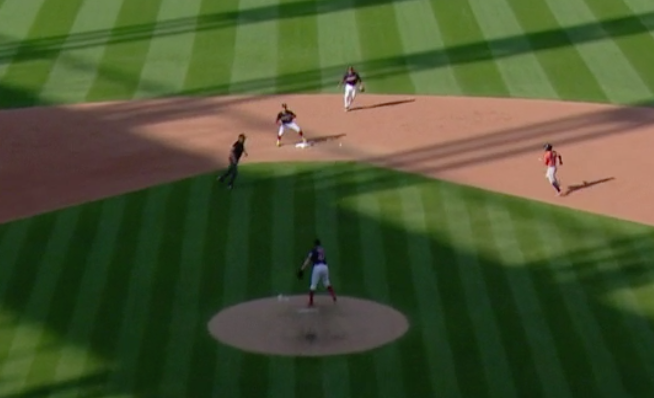 Lindor's judgement was questioned because he did not try and tag the baserunner out when the reality was he was forced to make his decisions with incomplete visual information. Remember ballplayers are taking in data and determining their course of action a second or more ahead of time. The Umpire crossing the road to get to the other side of the infield cost both Bauer and Lindor dearly. The 1/2 second delay by the hustling to do his job Umpire caused Bauer to not both not see where he should be throwing while also causing a delay in the trajectory and accuracy of the throw. Why didn't Lindor instinctually know to tag the runner at second and at least get one out? Because once a ballplayer has his lines of sight taken away, they basically lose their ability to foreshadow the best possible plan of action. Lindor had to lunge for the throw at the last second to get to the ball. I get that the Umpire messed up. I am not upset with TBS announcer Dennis Eckersley for missing what I saw when the play first happened. What I question is why can't there be a back up "guru" somewhere out there who can call in their observation and save the day from the point of view of giving Eckersley the corrected analysis. 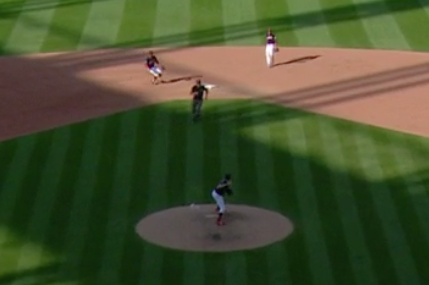 Sportscam Detective noticed Mr. Eckersley proceeded to comment about Bauer not being prepared to defend his position and that Mr. Lindor did not make the correct decision to tag the baserunner before the runner reached second base. Basically Mr. Eckersley impugned the abilities of both Mr. Bauer and Mr. Lindor when it was Eckersley who erred by not noticing the scampering, interfering umpire. The narrative that the third game was lost because of an umpire over zealously trying to do their job is a superior and more accurate storyline versus stating that two All Star Indians players totally messed up a play. I am suggesting to MLB to have some outside advisers available who can call in during a game and have the observations quickly evaluated. Even if the correction is made in the next inning, lets at least get the dissection of the play correct for history's sake. Yes, Sportscam Detective is available for such duties. SportsCam Detective would like to share certain sports moments that sometimes go unnoticed if it can correct an inaccurate narrative before hostile comments begin about the players from fans who are being wrongly informed about the play by play. These types of mistake scenarios exist all around us and people who come and help are called fixers. A good fixer uses the truth to explain what went wrong and to elevate the discussion back to the level that the fans and the "play by play" people are capable of producing. But Houston won going away so it didn't really matter, no? No, the score would have been 2-2 going into the bottom of the seventh inning and Bauer, who was pitching fine, could have gone another inning or two. Houston was barely making contact and to their credit, were lunging after Bauer's pitches and hitting balls into the ground and creating infield hits. Not exactly dominant hitting. 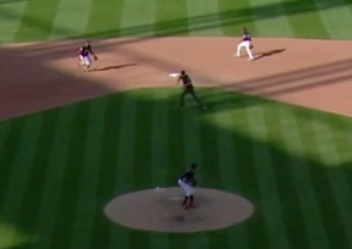 Bauer basically threw back to back double play balls and all he had to show for it was one out and two runners safe, and an exit from a game he had been pitching decently. But Houston was the better team, no? Yes, and that's just an another reason to not help them win, no? But worst still, to not notice an Umpire's unfortunate decision to run across the infield at the precisely wrong moment and then blame the umpire's wrong decision on two All Star caliber players, is just not right. Wait till betting is legalized and suddenly these ballplayers have a million angry betting "fans" blaming them for a bad outcome play that was not even their fault to begin with. Cleveland Browns vs New York Jets produces first Browns Victory since 2016, and a Strange Camera Quirk. When the Cleveland Browns kicked and made their first field goal to draw to within 14 to 3 against the New York Jets on their way to a come back 21- to 17 victory on September 20, 2018, complete with Baker Mayfield playing his first professional game, something strange happened as the ball rocketed into the sky on the first field goal attempt. As the kicked ball rose into the air, the ball clearly appeared to first move outside of both goal posts, and then come back inside the goal posts. The Thursday Night Football announcers noticed this phenomena as well. But when the field goal was shown from a different angle, one from directly behind the goal posts and most likely with a more conventional lens, the ball NEVER appeared to venture outside of the path of the goal posts, and this was commented on by the announcers. The prior week in New Orleans Sportscam Detective noticed the same phenomena on a field goal by former Browns Kicker Billy Zane. The ball seemed to do a dipsy doodle and then stay wide. Sportscam Detective believes the wide angle lenses on the aerial cameras used above the field of play that move on guide wires are using wide angle lenses that are distorting the path of the ball at a certain distance from the camera lens. This is not an attempt to slander the maker of the lens. However, the evidence is there, in the video recordings of both kicks. Sportscam Detective is concerned that if the aerial camera wide angle lenses have some kind of Bermuda Triangle zone in terms of distance from the camera and lens and the amount of telephoto or lack of telephoto lens used can create a momentary optical illusion, could this illusion incorrectly influence how the Instant Replay crew reviews the field goal of the ball perhaps stayed above the goal posts? Imagine having to rely on the aerial camera to judge an instant replay because the ball stayed above the field goal posts and the camera in the stands could not capture the flight of the ball. If Sportscam detective can find the video online it will be posted her so you can judge for yourself. In the meantime, it seems somewhat fascinating that lightweight portable wide angle lenses may have built in wide angle anomalies that can actually change the spatial relationship of two objects that are not on the same plane of view. Welcome to Sports Cam Detective. Welcome to Sports Cam Detective. We will explore the nuances in sports that are captured by Sports Cams on game by game basis.